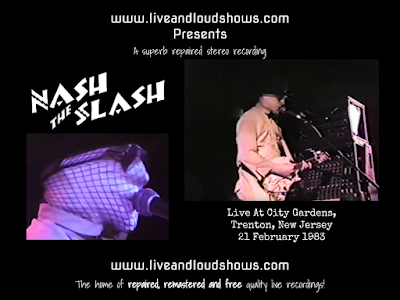 An outing for Nash The Slash from early 1983 with a set including a few songs from his album American BandAges which would be released the following year. For those who only really know him for the Children Of The Night album in the UK, the versions of Swing Shift and Deadman's Curve here are different - studio versions of these appeared on the compilation The Million Year Picnic - so it's a very interesting listen. This was a soundboard recording I think, although 1 track, Womble, is badly affected by what sounds like FM interference - which was mostly in good condition but some tracks were very noisy and/or hissy and recording quality took a nose dive during 1 or 2 songs. So while most of the tracks have only needed a fair bit of the old 30 band EQ to improve things, I've spent a lot of time trying to rescue some of the others. Womble is, I'm afraid, still rather noisy but worth a listen. Hopefully the rest of the gig makes up for it! You can download this improved recording for free here as one 320 kbps MP3 file. Or, if you would like to support the site with a small donation towards storage subscription and internet costs, in return you can have the show as separate, properly tagged MP3s or even lossless files in FLAC format; head on over to the Donations tab to see how you can do this. Either way - enjoy the show! So, a new Nash The Slash show on a sunday morning, how could the day start better? Well, I must say at a first look at the setlist I was a bit disappointed because I didn't like the American bandstand album when it came out. For me it didn't have the typical Nash-low-fi charme, very polished production, and the choice of songs...no originals...and then.."Born to be Wild"??? Come on. Later I liked it anyway, but of course it didn't beat the records before.